It’s that time again in the King household to do the bedroom shuffle. You know, where everyone moves around and changes beds & bedrooms? Well, Ryder, who just turned two is transitioning to a big bed. We’ve taken the front of the crib, but we think he’s ready for a real bed and we’re ready to move our oldest son, Aiden, in a room by himself. 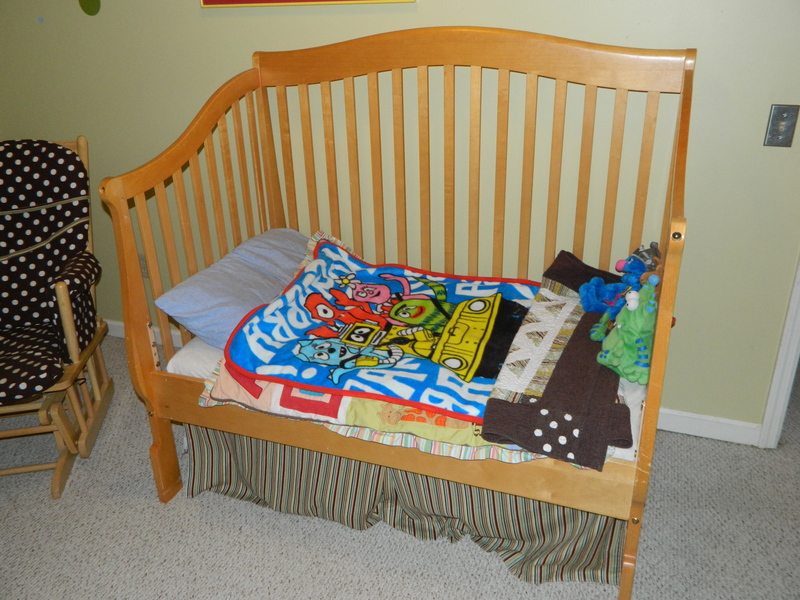 Ryder’s current bed is the crib and his new bed is going to be the one below. 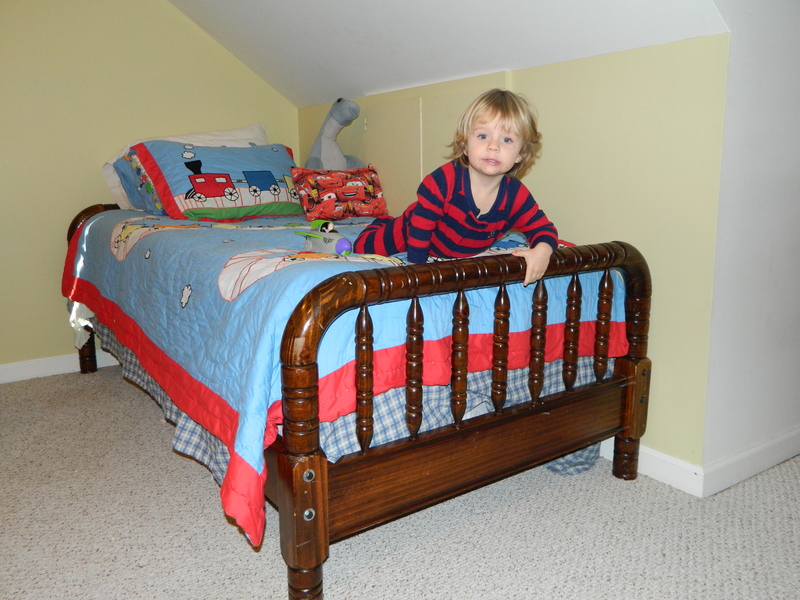 The twin bed is currently Aiden’s, so i am now on the chintzy hunt for a new one. Sent an email to my neighborhood to see if anyone had a queen size bed + mattress to sell. Came up with nothing. Checked Craigslist and found a handful of acceptable beds. I emailed all of them and waited to hear back. A funny thing about Craigslist is that you don’t always hear back from people trying to sell their stuff. You’d think they’d be all over it and immediately get back to you in hopes that you’ll buy whatever they’ve got. I only heard back from one person and I probably emailed 6 people about beds. So i took it as a sign that that is the one i should get and it was the best deal! 😉 So I was happy for that. 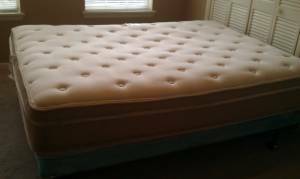 Here are the pics from the bed that i’m picking up today. I think it looks pretty good for a 7-year-old boy and it’s coming from a nice part of town, sorry that does play a part in my decision-making. 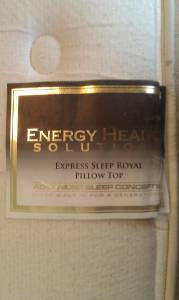 So how much did i pay for a queen pillow-top mattress, box spring & frame? $40. Yeah, it’s a pretty awesome price. I’m really excited to go get it and rearrange all the boy’s room upstairs. 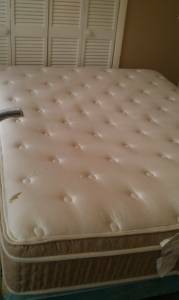 My question to you is, would you buy a used mattress? Obviously i would, but i kind of see it as the same as getting a used mattress from a friend or family member. Then you might ask, “but at least you know where it’s coming from”. True, but you don’t know everything your friends or family did on their mattress–you just make sure it doesn’t smell, no stains and when you lie on it you don’t sink to the floor. I do the same thing and if the house i go into to get it smells, looks filthy, or there are obvious hygiene problem with the sellers, i quickly turn around and say, “no, thanks”. Back to Aiden’s bed, it doesn’t have a head-board or foot board, not that it needs one, but we are going to try to make one out of these. 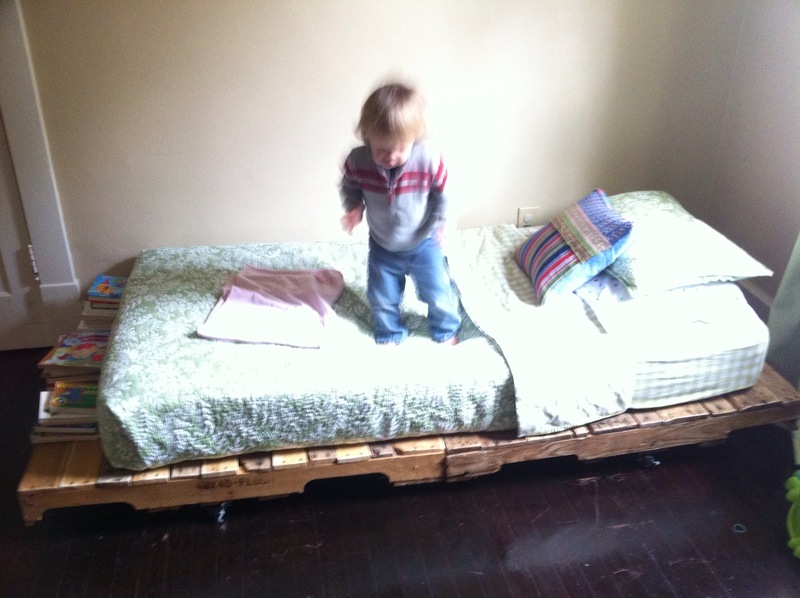 See the bed Ryder’s jumping on made out of pallets? 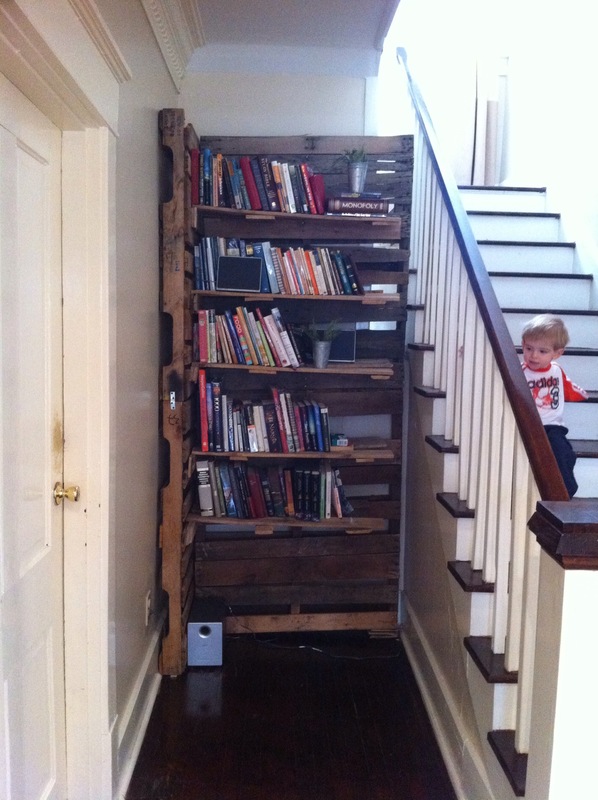 And then bookshelf made out of pallets? So my first thought was to make Aiden’s bed from these and just find a mattress, but then my score of $40 included the frame. 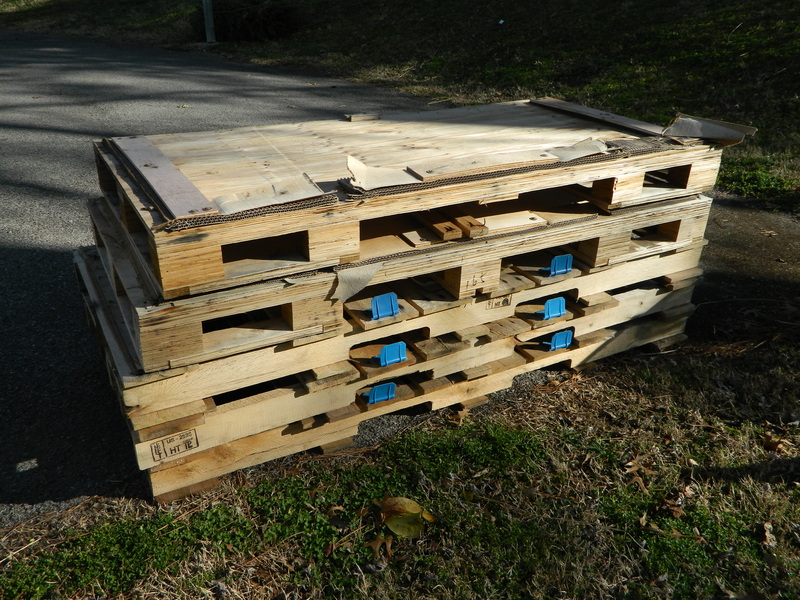 So now i’m thinking project head-board from the pallets, bookshelf and maybe a work table for me. Then all i have to do is choose a super cool color to paint them and waaa-lahh! I”ll have something super unique and special for Aiden’s new room (all for $40 + paint)! That’s all i got for now. I’ll come back and post a pic of Aiden’s new room once i get everything moving along! 40!?!?!?!! That’s a killer deal. Love the pallet head board idea. I know! We brought it home and i used almost a whole bottle of disinfectant spray on it, vacuumed it and we’re good to go! haha, nice. I was wondering how you cleaned it up. Found a color yet? Reag–you are the deal queen!